According to sources at Audi, the German automaker is planning a new city car that would be a small four-seat commuter that would get more than 280 mpg. 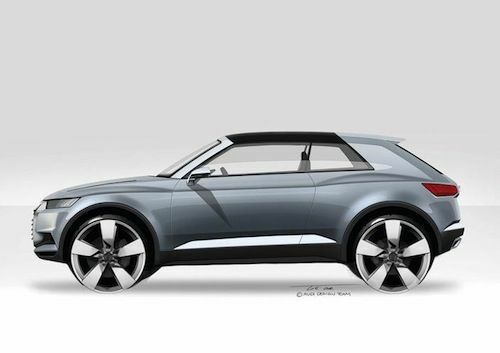 AutoCar has recently received reports from Audi “bosses” that the new small car would be based on the current European model Audi A1. The current A1 is a stylish, quality supermini, but it is expensive. Audi seems to be looking to bring an “affordable” alternative to the small car market that would compete with top-selling compacts like the new 2014 Ford Fiesta that is selling extremely well in Europe. The new city car from Audi is reported to have exterior styling that will be inspired by the new Audi Crosslane Coupe Concept pictured here that made its debut at the 2012 Paris Auto Show. The new Audi A1 based four-seater is said to be powered by a 1.0-liter engine but would certainly have to be paired with an electrical component to get the reported 282 mpg. Durheimer went on to say that the “1.0-litre car” will be able to use a modified version of the A1’s steel platform “because weight is not the biggest engineering challenge with this project”. Audi has been working on a new space frame that would significantly reduce the weight. It was developed with the new Crosslane Coupe Concept. They are able to reduce the weight of the interior as well as the suspension. Audi developed a manufacturing process that uses an exotic mix of aluminum, carbon fiber-reinforced polymer and fiberglass-reinforced polymer to produce the new "multimaterial" frame on the Crosslane Coupe Concept. The vehicle features a strong but lightweight structure. The reduced weight allows the vehicle to have improved fuel-efficiency over a heavier model. The report says that Audi could will likely use the same process of injection-moulded carbon fiber on the new city car. Audi has developed the new carbon fiber to be much more efficient than conventional manufacturing. Audi can make some of the new carbon fiber components in just two and half minutes. Audi is still in the beginning stages of developing the new A1 based 1.0-liter four-seater city car, and AutoCar says the new project could be at least three years from production. Audi is certainly moving their design strategy in a new direction, and the all-new city car promises to be the most economical and radically designed car Audi has ever sold. Audi is certainly on the forefront of design, carbon fiber technology and electric propulsion.